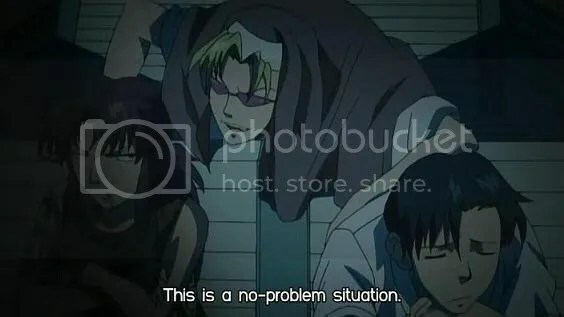 After a quick lesson about the town of Roanapur by Rock, we find him, Revy & Eda waiting in a car in an alley. 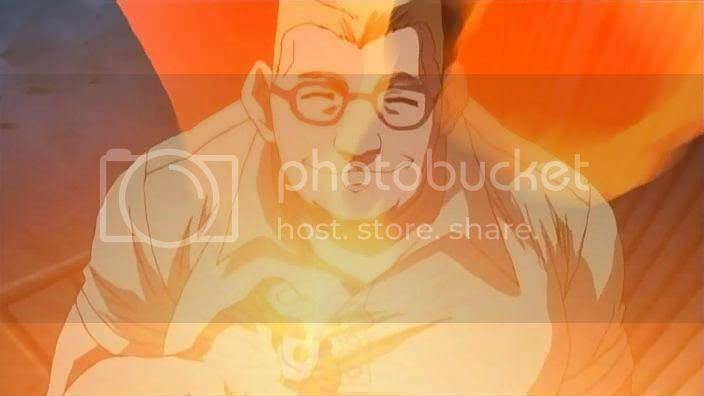 Eda’s master plan to make a quick buck involved tricking Jane into a near death situation where she’d have to accept their terms for rescuing her, and the plan is almost perfect as they pick up Jane and escape from the bounty hunters. 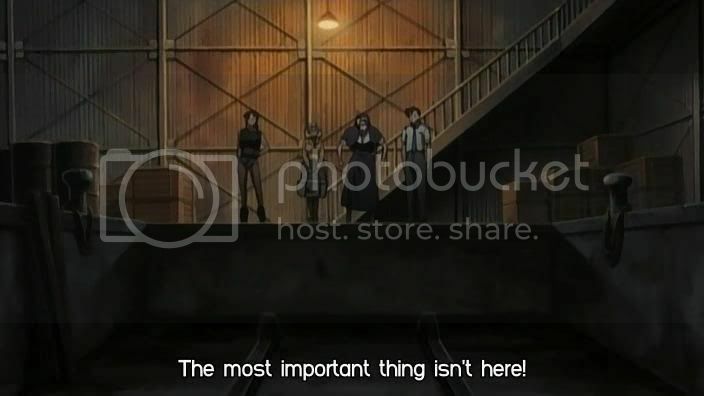 But one thing Eda didn’t count on, because she didn’t let Revy in on the plan earlier, was that Dutch & Benny are currently on a mission with the Lagoon’s torpedo boat, thereby eliminating the quick escape route she thought out! So they’ve got no choice but to tough it out in the Lagoon HQ as long as they can while Dutch & Benny rush back to get them, and sure enough all Hell breaks loose when the bounty hunters show up and bullets start flying. 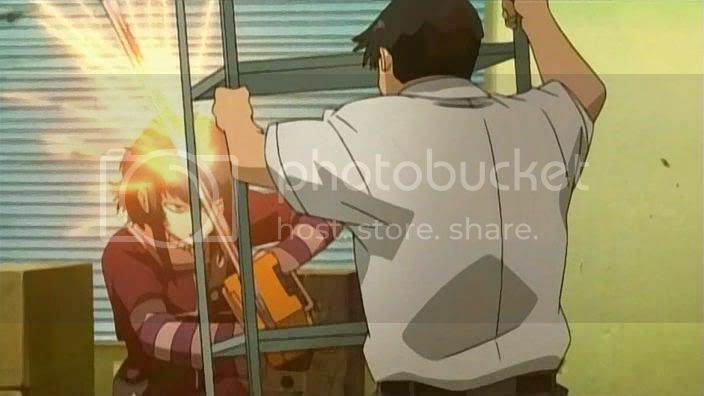 While Revy & Eda fend off the gunmen at the front door, Rock is forced to go one-on-one with the chainsaw wielding Sawyer the Cleaner, and Jane almost gets fried by pyromaniac Claude Torchweaver, who goes on to torch the dock exit to prevent anyone from escaping through there. Revy helps Rock run off Sawyer, and buys Rock & Jane some time to get up to the roof, but Revy & Eda are faced with a new problem as Chinese blade mistress Shen Hua shows up and makes her presence felt, and the show ends in a cliffhanger with the gun girls pinned down and Rock & Jane stuck on the roof with no way to escape. I obviously left out a lot of details as I’m either not trying to spoil too much or that there really isn’t much to describe in a gun fight. Just remember the golden rule in this types of situations: If you dress normally and don’t have a bizarre signature weapon, you pretty much bullet fodder for Revy & Eda’s body count in this series! ~ by 6six6 on November 26, 2006.
my computer cant see this post with ok coding maybe the wordpress is wrong? I will change laptop and see if it ok.
Ernest Hemingway~ Theres absolutely nothing noble in being superior for your fellow males. Accurate the aristocracy is becoming superior to your former self. 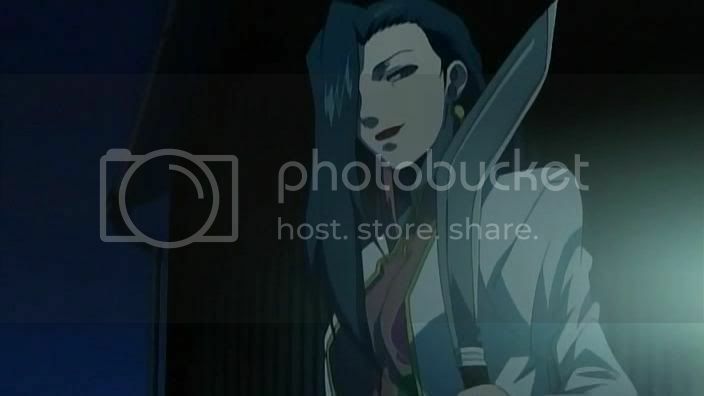 Αγγελος on Black Lagoon Season 3!